Y’know, normally if a band came along who’d formed only earlier this year, who had but two songs to their name, I’d think it was a bit early to be featuring them. Especially seeing as they haven’t played any shows even.But, dammit, Whirl just sound so ready to go on these two songs alone. The California band deserve to go places with their gorgeous shoegaze sound. Even the name sounds perfectly 1990 – and i mean that as a compliment. There’s six of them: Eddie, Loren, Byanca, Sergio, Joey and Nick. They have released their demo on cassette (if you think no-one buys cassettes any more, may I sugggest you start reading The Wire and stop reading Q; there has been a real increase in underground bands putting their stuff out on cassette) which you can buy via their myspace. I’m not the only one who thinks they’re ace, either. Christina Marie, one half of 17 Seconds Records’ act Factory Kids, and also writer of the very fine Girls Sold Out blog has already interviewed them, here. Paul Vickers is, I like to think , one of the great scottish eccentrics. Having fronted Dawn Of the Replicants – a band who should have been very much bigger than they were – he still continues to walk the streets of Edinburgh (I saw him walking along South Bridge not two weeks ago wearing a bizarre looking cloak), and to make weird and wonderful records. Live Paul Vickers and the Leg can certainly be an interesting propostion, and are not to everyone’s taste. Watching them at the SL Records 10th birthday do a few years back, one friend walked out, and another (who is a well-regarded scottish blogger) stated that they would go out of the way not to see them again. It was an interesting spectacle, granted, but also an intriguing one. Yeah, it’s demented. Yup, it probably makes more sense live, but damn it…in a world where 6Live is being taken off the air, where once proud music papers are more concerned with reinventing themselves as indie-lite heat…thank God for Paul Vickers. They clearly broke the mould after him. Everyone should hear this record…and I hope quite a few will go and buy it. 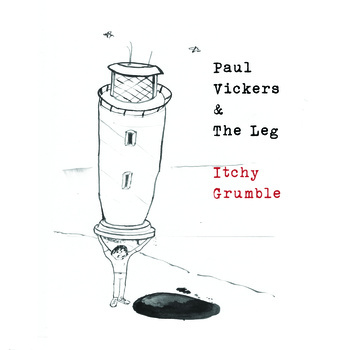 Itchy Grumble is out now on SL. I was trying to work out the other day why it is that a band’s third album has so much resting on it. Then I realised: it all has to do with War, U2’s third album. This was the point, in 1983, at which the band broke through and were on their way to becoming -let’s face it – the biggest band of the last thirty years in the western hemisphere. They did more successful albums (The Joshua Tree) and artistically better ones (Achtung Baby) but this was the point at which, with years spent on album charts, top 10 hits, enormo gigs etc.. bands that had come from an ‘alternative’ sphere would be seen as truly having broken through. In subsequent years, it’s been the third album that’s been the marking point for the likes of Blur and Idlewild, even if the likes of REM and Red Hot Chili Peppers had to wait far longer. Frightened Rabbit aren’t being talked about as having done a U2 – yet. But for a band not based in London, who are steadily making headway in the US (and touring alonside labelmates The Twilight Sad and We Were Promised Jetpacks) and appear to be ‘crossing over’, all eyes are on them now. Though the initial releases of their first two albums Sing the Greys and The Midnight Organ Fight may have made more impact north of the border than south it was a picture that was changing by the end of 2009. Zane Lowe and other DJ’s were picking up on the single ‘Swim Until You Can’t See Land’ – the first single from this new album, and The Midnight Organ Fight made the NME’s list of the Top 100 albums of the decade. So, the pressure is on them: to make the crossover, by delivering an album that’s good enough to make it, and take them beyond just being cult stars. Were Top Of The Pops still going, people would be expecting them to be putting out singles big enough for them to have a hit big enough for them to appear. Yet there’s also the worries of tall poppy syndrome, and that of whether in order to make the jump they’ll end up having to compromise what made them special in the first place. However, I think that Frightened Rabbit can hold their heads high with this release. It’s not perhaps as immediate as The Midnight Organ Fight – yet, paradoxically, it feels more anthemic than either of their first two studio albums put together. Album opener ‘Things’ sounds like Frightened Rabbit still – but this time, instead of little clubs, it’s sets at outdoor rock festivals where they will be appearing ever higher up the bill. The aforementioned ‘Swim Until Yuo Can’t See Land’ starts off so fragile and yet proves itself to be a monster and makes even more context within the album than as a single. Current single ‘Nothing Like You’ agains sounds like it could and should be a hit. Tellingly, on YouTube there are already a few people muttering that it’s not like FR used to be. Yet the catch 22 is that if it were, they’d be accused of repeating themselves. 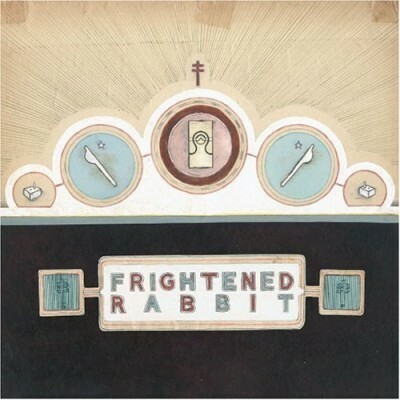 As an album it still feels like Frightened Rabbit -and with the sense of the cold and grey that seeps into your sou, bringing you down in the winter. It’s not a jaw-dropping album, but it is still an excellent one. Frightened Rabbit are still singing the greys. And this time, they’re inviting everyone around the campfire. Budge up, there’s enough room for everyone. The Winter Of Mixed Drinks is released on Monday on FatCat. 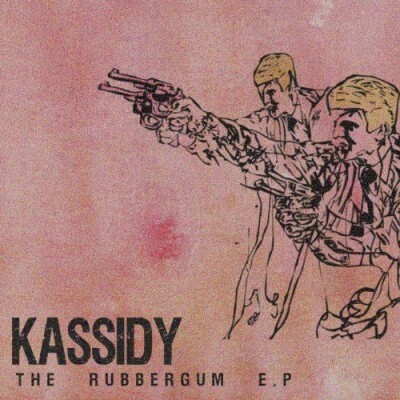 Glasgow quartet Kassidy (previously known as Cassidy) have issued a fine five track EP, which works as a fine introduction to the band, at least if you haven’t already heard their previous single ‘Night In the Box.’ The previous single also contained ‘Night In the Box’ and ‘The Traveller.’ So far as i can tell these are the same versions which made up the earlier single (which was released on King Tut’s Recordings. Consisting of Barrie-James O’Neill, Hamish Fingland, Lewis Andrew and Chris Potter, they may be based on the west coast of Scotland but follow a fine tradition of doffing their west coast of scotland caps to the west coast of America (see also Teenage Fanclub, Cosmic Rough Riders etc..) They have been compared to the Kings of Leon, but this is definitely more west coast than deep south boogie. I’ve played this several times and find that the harmonies and songs are proving steadily more and more irresistible. Whether this will work over the course of a whole album without some more ingredients coming into the mix remains to be seen, but this is a very strong EP. The Rubbergum EP is out now on Vertigo; available on download and at all good record shops. See the video for Kassidy -‘The Betrayal’ here. Pop along to their myspace and make friends and hear the whole EP. 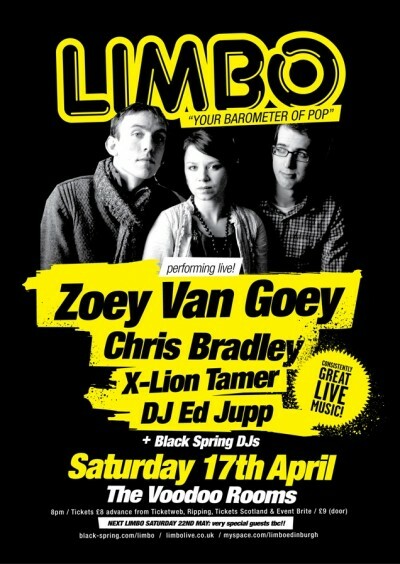 Yours truly DJing, two of 17 Seconds Records’ acts and Zoey Van Goey headlining. Blogger extraordinaire, eh? Cheers for that! And three weeks later, Tigerfest starts in Edinburgh, we have two nights as 17 Seconds Records…watch this space. It was a bit of a blogger’s convention, almost. Fresh from Mother India’s Cafe, Mrs. 17 Seconds and I were barely in the door of the Captain’s Rest, before we bumped into Jim AKA the Vinyl Villain and Comrade Colin, who used to write the very much missed And Before the First Kiss. They also introduced me to Lisa Marie from Last Year’s Girl, so this was very much the place to be last night. I love the Captain’s Rest, being as it is so small and intimate that it makes Sleazy’s look like the Barras. It might be snowing in Scotland today (just for a change), but downstairs at TCR it was like being in a sauna. You can literally see the white’s of the performers’ eyes, and as the night wore in, the moisture on their heads.. And performer is what I would describe David Thomas Broughton as. Whilst he has some interesting ideas, it became like an endurance test far too quickly. Mrs. 17 Seconds remarked that it was ‘like watching someone else’s nervous breakdown.’ She’s a very perceptive lass, my wife. So here it is. It differs how many tracks you might find on it (10 on eMusic, 12 on iTunes) but having played this album several times over the last few weeks, it definitely get the thumbs up from me. It should be stated that this is probably not the most original album you will ever hear (then again, how many albums can we say that about?) However, what impresses with this album is that it feels fresh and marks the point in which the proto-punk of the 1960s, both in terms of Garage punk and the Velvet Underground meets with the tunes of the c86 era. Some songs have an aspect of the ‘twee’ about them (twee in the c86 sense – I definitely mean it as a compliment), like the rather fine opener ‘C’Mon.’ Other tracks like ‘Flammable’ bounce around like an early strokes covering The Stooges (again, I mean that as a compliment). At half an hour long or so, this doesn’t outstay its’ welcome, and my interest has definitely been raised. It’s a huge amount of fun – and I’ll be interested to see what they are like live. However, their second album will need to develop substantially in order to show that they have staying power. 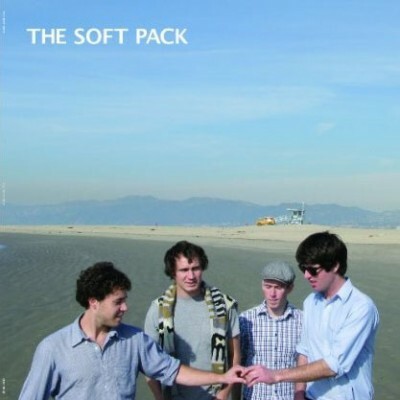 The Soft Pack is out now on Heavenly. It’s been a fantastically busy month around these parts. 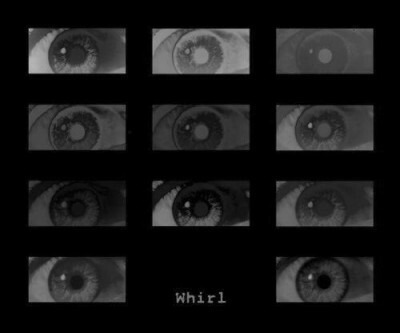 Following on from The Dirty Cuts’ ‘2 Page Spread’ single, the Factory Kids EP, The Wildhouse’s first two albums being re-issued…well, what more to report? 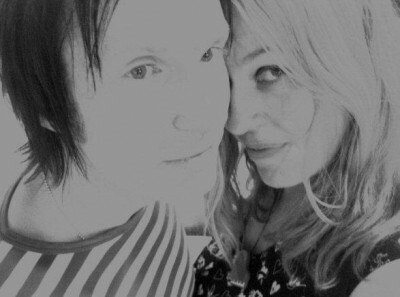 Tim and Christina, AKA the Factory Kids will issue their second EP, through us on April 5. The follow-up to EP1, which is also known as the You Used To Call Me Baby EP, will be One EP. Hey, Peter Gabriel made four different albums, all called Peter Gabriel, so what’s your point? …and the band have graciously allowed us to give ‘Holiday Crease’ away as a free mp3. If you still haven’t heard the band, shame on you, you may download the b-side for free. Jellymaid Music, based in Portsmouth, England, have been responsible for putting out a couple of gems. Last year it was The B Of The Bang’s Beginning. Middle. 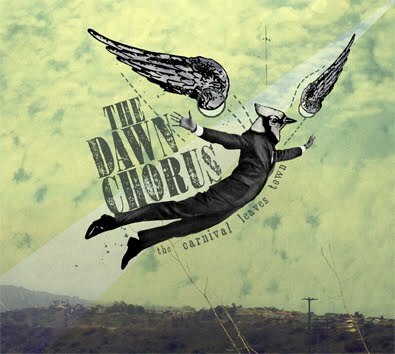 End and The Autons’ Who Do You Think You Are Kidding?– and this year it is the sophomore album from the Dawn Chorus. Much as I loved ‘The Hope Will Kill Us’ from from the band’s debut album The Big Adventure, I wasn’t blown away by the parent album. But since this album arrived in my in-tray, it has enjoyed several listens and a definite thumbs up from yours truly. Comparisons have been made with Gogol Bordello – not because they actually sound anything like them, but because of the spirit of the album. It truly is the spirit of a Carnival; arrival, show and departure all. There’s thankfully no press release sporting a lot of crap about a thread running throughout the album, so it works both as an album in its’ own right and with some standout tracks. These would have to include ‘Carnivalesque’ (featuring Frank Turner which they’re chuffed to bits about) and ‘The Guilt.’ Is it a ‘concept’ album? Who knows? It’s a hell of a lot of fun. Musically, comparisons could be made with the likes of The Coral’s first album – the fact that some of these songs could be sea shantys, and rather like that first album, they’re throwing everything in there and making something wonderful. Broken Records, for the way the seem to be inocorporating bits of other ‘folk’ music (for want of a better label) and making something that is distinctively theirs. And like labelmates The B of the Bang, the feeling that they understand that a rimeless pop song does not mean it has to sound like another 1960s rip-off. The band have grown considerably over the last couple of years, and hopefully this album will win the plaudits it so richly deserves. The Carnival Leaves Town is out now on Jelly Maid Music. Go here to download the mighty ‘carnivalesque’ for free. All they ask for is your email, which seems pretty reasonable. 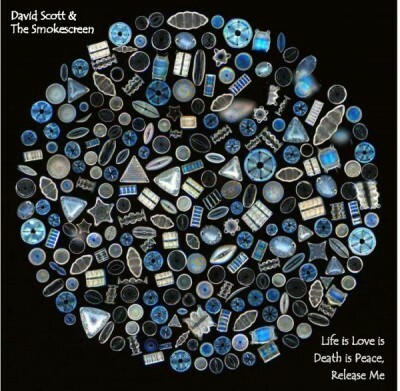 Presenting…David Scott & the Smokescreen! 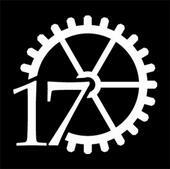 …AKA 17 Seconds Records’ latest signing. David Scott was a member of both Motorcycle Boy (the band formed by members of Shop Assistants and Meat Whiplash) and Riverhead. Now based in Kentucky, he released his album Love Is Life Is Death Is Peace, Release Me last year. We will be re-releasing it this year, and David is planning to come to the UK to do some dates. For now, enjoy this very fine track as a free sample of what to expect.